I'm a firm believer that, regardless of how interested you truly are in cooking, everyone should have a few strong recipes in their locker. I'm not saying that you need to know anything complicated, or to be able to dabble in classic culinary techniques, but if you're able to make a decent burger, throw together a tasty salad, and bake a delicious batch of cookies, chances are you'll do well out of life. Take, for instance, the humble roast spud. The cornerstone of any Sunday dinner worth it's salt, a perfectly roasted potato is a glorious thing that will make you friends and get you laid (probably not true). 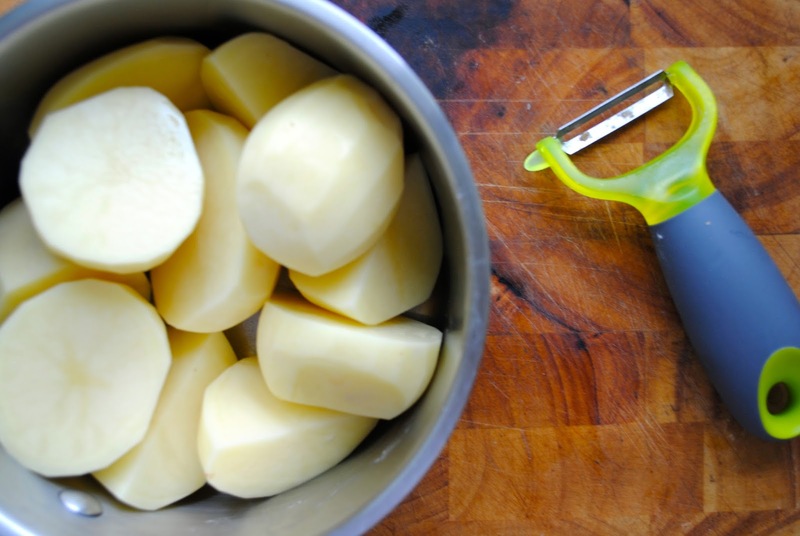 So, for all of you lovely people I've put together my top tips for those 'triffic taters. Enjoy. You gotta start with the right spuds and I'm a big fan of the Maris Piper. A English all-rounder with creamy, fluffy flesh - these fellas are perfect for roasting. Some people swear by the Desiree, or King Edward which also work great...take your pick. (I'm not a pedant, life is short). A few important steps here, so listen up. Peel (obviously) and cut the taters into sizeable chunks, not too small you crazy person, you. I was always taught that your roasties should be about the size of an egg and that's never done me wrong. Stick in a pan and fill with cold water then give the potatoes a good rub to remove as much excess starch as possible - this will help your spuds brown nicely and also gives them an extra bit of crunch. Drain and repeat a few times until your water remains clear. Cover with cold water and bring to the boil. I appreciate I'm telling you how to boil potatoes here, but stick with me. You want to give them a good boiling...let them go until they're just about holding together, that's how you achieve maximum fluffiness. Then carefully drain and LEAVE. Let them chill for an hour or so until they're completely cooled down. Go and, I dunno, read a book, check your Twitter feed or take the latest Buzzfeed quiz (apparently if I were a kitchen appliance I'd be a toaster). Hey look it's me! I go into the pan with vegetable oil, and LOTS of it. Don't be shy here, if you're after something healthy you should have eaten an apple. I also add a nice dollop of butter which, apparently, helps to keep the potatoes moist. Though saying that, it's mostly a force of habit more than anything else...but why risk it? Stick in a hot oven (at least 200C) to warm through and then place on the hob until the oil gets ridonkadonk hot and starts smoking. Carefully add your potatoes, turning so that they're evenly coated in the oil, and bung the tray back in the oven. 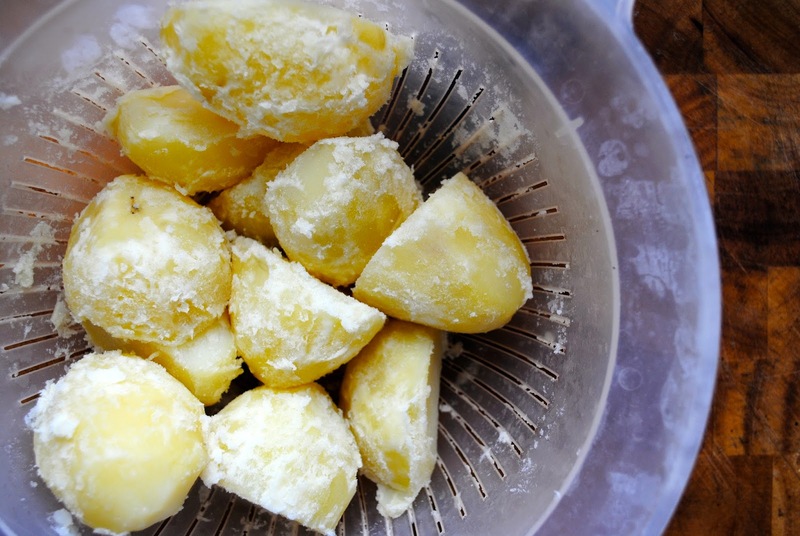 Your roasties need about 40 minutes or so, but keep an eye on them and give them a good shake every now and again. Once they're golden brown, take them out, drain them and give them a good pinch of sea salt, and you're good to go. That's my perfect roast potato. Let's see you beat it.